e-RADS addresses the regulatory requirements of the Ionising Radiations Regulations 1999, which requires that staff who are not closely involved with the work involving ionising radiations are provided with suitable information to avoid being unnecessarily exposed. e-RADS was originally developed in a joint project between the Plymouth Hospitals NHS Trust and Health Education England e-Learning for Healthcare to provide an e-learning resource for hospital staff. The material has since been revised for national use, with the support of expert authors within the wider NHS. e-RADS covers basic radiation safety for staff who come into contact with patients undergoing medical exposure to ionising radiations. It uses an interactive e-learning approach to improve the safety of staff by providing them with the information, knowledge and understanding of the different types of radiation sources that can be used within the hospital environment. It identifies the importance of following the safety precautions that are in place to reduce the risks associated with radiation and the basic principles associated with keeping their own exposure As Low As Reasonably Practicable (ALARP). e-RADS is aimed at those staff that work in areas where patients are exposed to x-rays or treated with radioactive substances who would not normally receive any formal training to work with radiation e.g. ward and theatre staff. Staff who operate x-ray units should refer to the sessions in the e-IRMER (Ionising Radiation (Medical Exposure) Regulations) programme. The sessions are of value to ward and theatre staff, porters and facilities, catering, domestic and mortuary staff. They are also of value to managers and patient representatives. e-RADS provides staff with an understanding of the types of controls in place to warn of the radiation hazards, the monitoring available for some staff and the protective devices or methods used to keep doses ALARP. The differences between the risks associated with high dose therapies and lower dose diagnostic uses of radiation and the difference between radioactive substances and x-rays are all considered. Staff are able to gain a better perspective on the magnitude of the radiation risks involved and why it can be appropriate in many cases not to be over concerned. If you already have an account with e-LfH, then you can enrol on to the e-RADS – Radiation Safety for Staff programme by logging in to the e-LfH Hub, selecting My Account > Enrolment and selecting the programme. You can then access the programme immediately in the My e-Learning section. 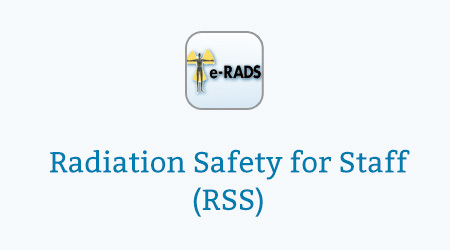 The e-RADS – Radiation Safety for Staff programme is also available to NHS healthcare staff via the Electronic Staff Record (ESR). Accessing this e-Learning via ESR means that your completions will transfer with you throughout your NHS career.